Here is our very first report on the progress of the simultaneous photometric campaign. The weather has been quite merciful and we have observed in all about an 80% of the scheduled time. The photometric observations will help us to interpret the Doppler signals coming from HARPS spectra. The RedDots campaign started on June 18th at ASH2 (Chile) and has been quite successful up to now! We have only lost 3 nights out of 16 nights due to cloudy weather. The photometric monitoring for the three targets, Prox Cen, Barnard’s star and Ross 154, is being carried out using two broad-band filters (V,R) for Prox Cen and Ross 154, and three narrow-band filters (OIII, SII and H-alpha) for Barnard’s. One epoch of data is obtained every night for each star. This commonly consists of about 30 measurements in each filter for Prox Cen (that accounts for, approximately, 70 min of data collection), 30 measurements in each filter for Ross 154 (60 min approx.) and 15 measurements in each filter for Barnard (40 min approx.). Previously, a pre-campaign was already carried out to test and characterise the photometric variability of Ross 154. We used the five filters mentioned above (V, R, OIII, SII and H-alpha) and collected measurements on 29 nights. The RedDots campaign started at SNO (Spain) as soon as June 11th, observing Barnard’s star using B, V and R Johnson filters. We acquire one epoch each night, consisting of 30 measurements in each of the three filters, which means approximately one hour collecting data. Previously, a 11 nights pre-campaign was carried out to choose the best comparison stars to Barnard’s. Since the beginning of the main campaign on June 11th, we can not complain about the weather in Sierra Nevada: we observed 18 out of 23 nights; the 5 lost nights were cloudy, or too windy, or too many cirrus spoiled our observations. The table lists the filters used in each of the observatories doing the photometric follow-up of the three targets. 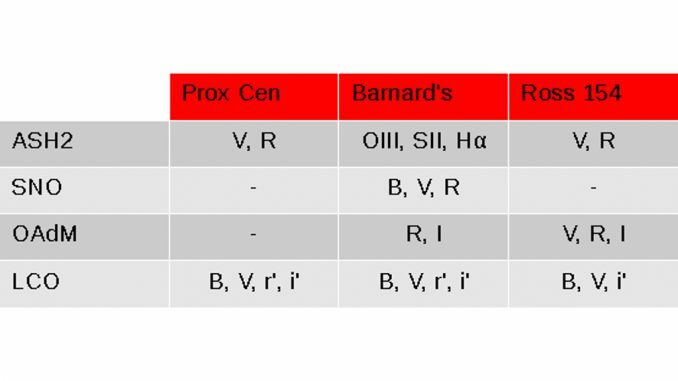 B, V, R and I are broad-band Johnson filters with central wavelengths covering from approximately 445 to 806 nm; r’ and i’ are Sloan filters covering 620 and 765; while OIII, Halpha and SII are centred in the emission lines of its elements, 500, 656 and 672 nm, respectively. Note that due to its southernmost declination (-62 deg) Prox Cen cannot be observed from SNO or OAdM. The Joan Oró telescope (TJO) at the Montsec Astronomical Observatory (OAdM) started the photometric monitoring of Barnard’s star and Ross 154 on the night of June 15th. The TJO works in a completely unattended manner, so all we needed to do was to configure the observing strategy, and then the telescope automatically schedules and executes the observations every night if the weather conditions are good. The first couple of nights were unfortunately lost, as we needed to re-adjust the exposure times and defocus configurations. As both M dwarf targets are very bright, the images needed to be defocused in order to avoid the effects of scintillation that usually appear with too short exposure times. However, we could collect plenty of data during the last two weeks, and only 3 nights were lost due to bad weather conditions. One measurement per night is taken for each target by combining 5 images in R and I filters for Barnard’s star, and V, R and I filters for Ross 154. Las Cumbres Observatory is following Proxima Cen and Barnard’s in B, V Johnson and r’, i’ Sloan filters and Ross 154 in B, V, i’ with the 0.4 m telescopes around the globe. Each object is observed around 15 min in each filter, and observations required in each filter are feed independently in the telescope queue mode to maximise chances of observing time. This has the drawback that observations are sometimes only obtained in some of the filters each night. Ross 154 have also been observed with a higher time cadence from June 22 to July 1st for a better characterisation of its photometric variability. We will continue to perform observations in this high-cadence mode. Over 5000 Photometric Observations Logged to AAVSO database so far! It is nice to see that the Belgian contribution to this project is strong ! Could you please share light curves of the three stars using your scopes and how they compare to AAVSO data? please, keep an eye on the Science log section, we will be uploading soon some light curves from our photometric follow-up observatories.